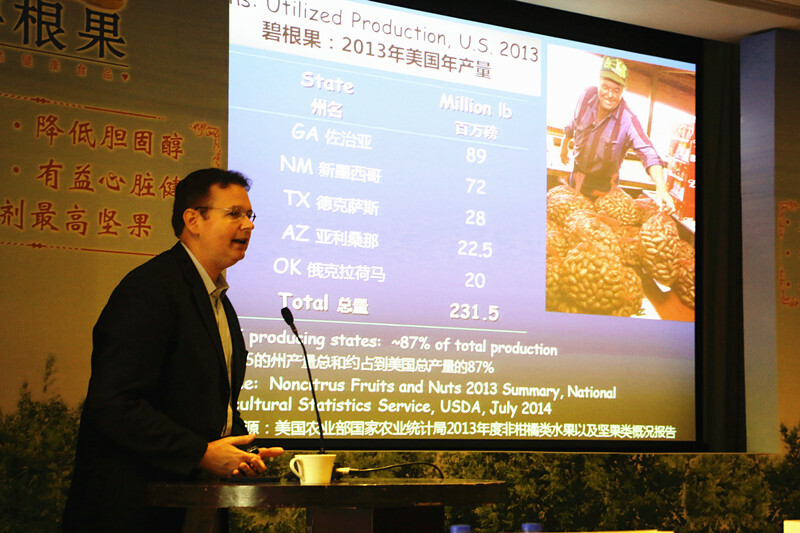 The National Pecan Growers Council sponsored a multi-city seminar series on the nutritional and clinical value of pecans in the human diet in China. The program was an FAS/MAP initiative funded by U.S. pecan grower contributions. Dr. Ronald B. Pegg, Associate Professor of Food Science, The University of Georgia, and Dr. Randy Hudson, Vice-President of The National Pecan Growers Council, presented the program. The three-city effort was coordinated by Ms. Mabel Zhuang and MZ Communications, the affiliated marketing group managing the U.S. Pecans efforts in China. The first program was hosted by Betty’s Kitchen, an internationally-renown media publishing group with the central office located in Geneva, Switzerland. The China affiliate hosted the nutritional seminars and pecan cooking demonstrations at the M-Plus Cafe in the heart of Beijing on Monday September 22, 2014. The event began with an introduction and welcome by Mr. Bruce Zanin, Director of Beijing ATO. Following his comments, a signing ceremony was held by Mr. Chen Xianbao, Chairman, and Madam Weng Yangyang, Vice-Chairman and Executive Secretary, of the Specialized Committee for Roasted Seeds and Nuts of China, National Food Industry Association. The official signing finalized a joint agreement between the China Nut Roasters Association and the U.S. Pecan Industry on Quality and Grading Standards. This agreement represents the first formal attempt to develop quality and marketing standards for the international trade of pecans between the U.S. pecan growers and the Chinese processors. The signing ceremony was followed by general comments from Dr. Hudson relating to the U.S. pecan industry and then Dr. Pegg, who presented the “Clinical and Nutritional Value of Pecans in a Daily Diet”. The presentations were well received by all the Chinese media present. It is estimated that over 20 media groups including TV, radio, magazine, and newspaper were represented at the seminar. On Wednesday September 24, 2014 the second seminar on the “Clinical and Nutritional Value of Pecans in a Daily Diet” was presented in Lin’an City, Zhejiang Province, China. The conference was hosted at the Wonderland Hotel located on Green Mountain Lake in the suburbs of Lin’an City. The most concentrated manufacturing of nuts and seeds in China is located in the proximity of Hangzhou, China (Lin’an) area. The turnout for the presentations exceeded expectations! Over 100 pecan roasters, government officials, and media representatives were in attendance. The Hangzhou session began with an official welcome and opening remarks by Mr. Xu Zhongwu, Chairman of the Lin’an Roasted Seeds and Nuts Association. He warmly greeted all guests and participants to the seminar. Additional comments were made by Ms. Valerie Brown-Jones, newly appointed Director of the U.S. Agricultural Trade Office, Shanghai. A comprehensive and hour-long presentation was then delivered by Dr. Ronald B. Pegg of The University of Georgia on the “Clinical and Nutritional Value of Pecans in a Daily Diet”. Dr. Pegg highlighted the nutrients of pecans and recent findings on the role of pecan consumption related to the amelioration of chronic disease states, such as cardiovascular disease, inflammation, and certain types of cancer. Following Dr. Pegg’s presentation, Dr. Randy Hudson, Vice President of the National Pecan Growers Council and a member of the Executive Board of U.S. Pecans, gave a talk on the production, marketing, and quality attributes of U.S. pecans. Dr. Hudson spent considerable time over the course of his hour-long presentation discussing the components of grading and marketing pecans. Emphasis was placed on describing the new set of standards and regulations recently established through a cooperative agreement on marketing pecans in China. There was significant interest in establishing a mutual grading and standards process for the U.S./China pecan trade, and this was the impetus for developing these regulations. Toward the end of his presentation, Dr. Hudson summarized his comments by expressing the necessity that all Chinese traders clearly understand what is meant by variety, count, and grade when purchasing U.S. pecans. The conference was followed by a state dinner, hosted by government officials and the select committee for roasted seeds and nuts. On Thursday September 24, 2014, Drs. Hudson and Pegg traveled to Guangzhou, China, to prepare for the third and final seminar series. Upon arrival to the city, they were transported to Heshan, Guangdong, where they met with Mr. Lai Xiaojun of Old Urchin, a joint-venture Guangdong Senhe Nuts Food Co., Ltd. Old Urchin processes and distributes pecans from its two factories in the Heshan region near Guangzhou. An older factory covers an area of over 35,000 m2, while the newer nut processing facility has an area of over 41,000 m2. Drs. Hudson and Pegg visited the newer plant and were greatly impressed by the layout, new modern equipment and the tree nut chemical/ microbiological quality control testing laboratories within the plant. On Friday September 26, 2014 the third and final pecan seminar series in China was presented in Guangzhou, Guangdong Province. The seminar was hosted at the Sheraton Hotel, 208 Tianhe Road, Tianhe District in downtown Guangzhou. A smaller crowd than that at Hangzhou attended, but again comprised a variety of parities interested in pecans; these included processors (e.g., roasters), buyers, government officials, and the media. In all there were over 50 participants in attendance. The Guangzhou session began with welcoming remarks by Ms. Melinda Meador from the Agricultural Trade Office (ATO) in Hong Kong. Ms. Annie Lai, a marketing specialist also of the ATO Hong Kong office, was in attendance. Following this, Mr. Lai Xiaojun, Chairman of the Guangdong Southern Nuts Industry Association, gave the official welcome to the participants and speakers. Unlike the previous two seminars, everyone had electronic headsets with direct translation from English to Chinese on channel 1 and translation from Chinese to English on channel 2. This format was far superior to that in Hangzhou, as there was no significant delay between the speaker and the translation. This resulted in the presentations flowing better and enhanced engagement with the audience. 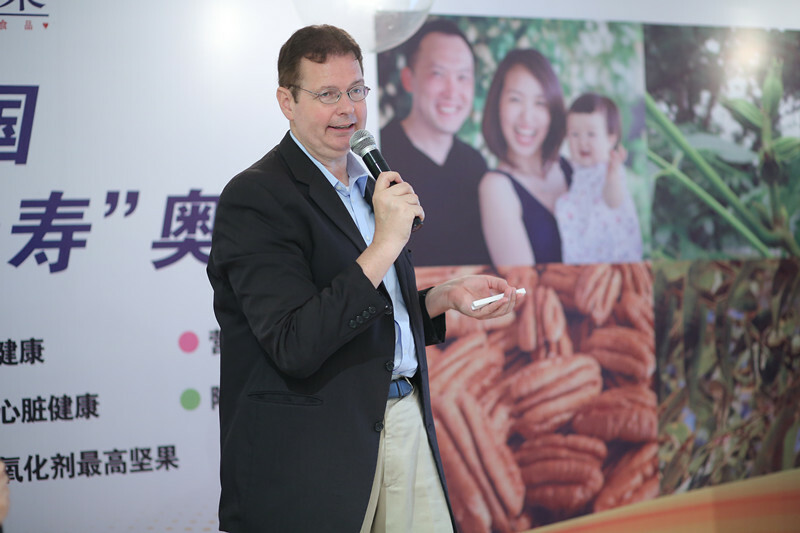 Mr. Xiaojun thanked U.S. Pecans for coming to China and sponsoring the educational event. A comprehensive, hour-long presentation was then delivered by Dr. Ronald B. Pegg of The University of Georgia on the “Clinical and Nutritional Value of Pecans in a Daily Diet”. Dr. Pegg highlighted the nutrients of pecans and recent findings on the role of pecan consumption related to the amelioration of chronic disease states, such as cardiovascular disease, inflammation, and certain types of cancer. With the direct translation format, Dr. Pegg was able to devote more time in explaining details of the studies discussed as well as breaking down some of the terminology into its fundamental components. Following Dr. Pegg’s presentation, there was a lively discussion with the audience. Some excellent questions were posed by some of the largest pecan buyers in China. A coffee break then lasted for ~40 min. During this time, the participants networked with Drs. Hudson and Pegg as well as enjoyed a variety of pecan baked goods prepared by the hotel with the coffee and tea. After this, Dr. Randy Hudson, Vice President of the National Pecan Growers Council and a member of the Executive Board of U.S. Pecans, gave a presentation on the production, marketing, and quality attributes of U.S. pecans. Dr. Hudson spent considerable time over the course of his hour-long presentation discussing the components of grading and marketing pecans. Emphasis was placed on describing the new set of standards and regulations recently established through a cooperative agreement on marketing pecans in China. There was significant interest in establishing a mutual grading and standards process for the U.S./China pecan trade, and this was the impetus for developing these regulations. He also dealt with the importance of moisture control in nuts shipped in refrigerated containers to China during the summer season. He discussed how the nuts needed to be “conditioned” so that once taken out of refrigeration they wouldn’t pick up significant quantities of moisture leading to deterioration of quality in the form of mold and rancidity development. Toward the end of his presentation, Dr. Hudson summarized his comments by expressing the necessity that all Chinese traders clearly understand what is meant by variety, count, and grade when purchasing U.S. pecans. The conference was followed by a state dinner at the Sheraton.